PROSH 2012: Wednesday April 4. WELCOME TO THE 81ST PROSH! Prosh is the annual satirical newspaper writer, published and distributed by the students of The University of Western Australia. This year, we celebrate the 81st paper since the event’s conception in 1931. Prosh is written by a tireless crew of students, who labour to make the content of entertaining and satirical, offering everything from razor-sharp observations of local and global events to downright hilarious black comedy. Prosh will be held this year on Wednesday 4 April 2012, when thousands of student volunteers in ludicrous costumes descend on the city and surrounding areas to sell the paper to an unsuspecting Perth public. The event starts at 5am, and climaxes in the City with a foot parade (PROSHession) starting in the Murray Street Mall at midday. This year’s Prosh’s charities are Wheelchair Sports WA, Down Syndrome WA and PCYC. We ask everyone to embrace Prosh, by donating generously and taking all content for the satirical and comedic brand Prosh is uniquely known for. 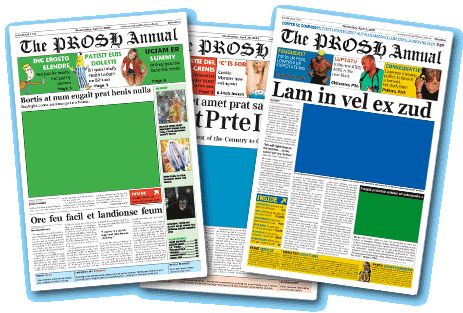 You can participate by purchasing Prosh merchandise, donating generously on Prosh day or via our website, joining in by selling the paper on April 4. To write, one can come to writers’ nights (every Tuesday at 6pm in the Guild Building), or contact us to sign up for layout weekend (30 Mar - 1 Apr). Even by just spreading the word, you can help. This page was last updated on 04 April 2012. View for printing. Collected over $140 000 for charity!